Among the earliest recorded writings are found on clay tablets uncovered in the ruins of ancient Mesopotamia, the land now identified as Iraq. These are carbon dated at about 4,500 years BC. This in turn suggests that Sumerian writing was invented between 6,000 and 7,000 years ago. But the Sumerians created an advanced civilization which means there was an unwritten history that had its origins long before these dates. The real origins of the human race have been the subject of intense archaeological research and scientific study for as long as anyone can remember. The best estimates of pre-history suggested that a type of humanoid, known as Homo erectus, existed in Eurasia about 1.8 million years ago. Modern humans, or Homo sapiens, first emerged in Africa between 60 and 70,000 years ago. Researchers also have uncovered the fossilized remains of various other earlier type humanoids that offered a variety of appearances and sizes that existed before Homo sapiens. Some were literal giants standing over eight feet in height while others were short “hobbit” in size. No one knows the true history of these early “people” but it is clear from the tools and cut animal bones they left behind that they were hunters, capable of killing large animals, and they knew how to produce fire. They may also have been capable of building sea-going craft because their remains have been found on various islands. DNA research also has revealed that various types of early humanoids mated with each other to produce cross-bred versions of their kind. Some type of humanoid . . . possibly Homo erectus . . . occupied the Philippine Island chain an estimated 700,000 years ago. An archeological team has recently uncovered man-made tools and bones of various animals showing sharp cuts in them, revealing that the people living there were hunters. A team of researchers led by Thomas Ingicco of the Natural History Museum in Paris, uncovered 57 napped stone tools and about 400 butchered bones of deer, lizards, turtles and even a rhinoceros, suggesting these were skilled hunters at that early time. And if you think 700,000 years was a long time in the past, consider yet another recent discovery in Algiers by researchers from the National Research Center for Human Evolution in Spain. With extensive carbon dating this team believes it has uncovered stone tools and butchered bones dating back 2.4 million years. If they are right it means some kind of humanoid or intelligent beings were hunting animals long before Homo sapiens or even Homo erectus emerged from the jungles of Africa. Now because of the warming earth and the melt-down of ice in Antarctica, research teams are discovering evidence that humanoids once lived on this long-hidden continent as well. Last February a team led by geologist Scott Amundsen from Wyoming State University discovered the remains of a stone building that they believe once stood about 30 meters high and was the size of the ancient amphitheater in Rome. But no, Joe, the findings in Antarctica are getting even more interesting. Also this year the fossilized skeletal remains of what looks like extremely tiny humans . . . dated to be at least 600 million years old, were uncovered by a research team digging through sedimentary rock in search for possible remains of dinosaurs. 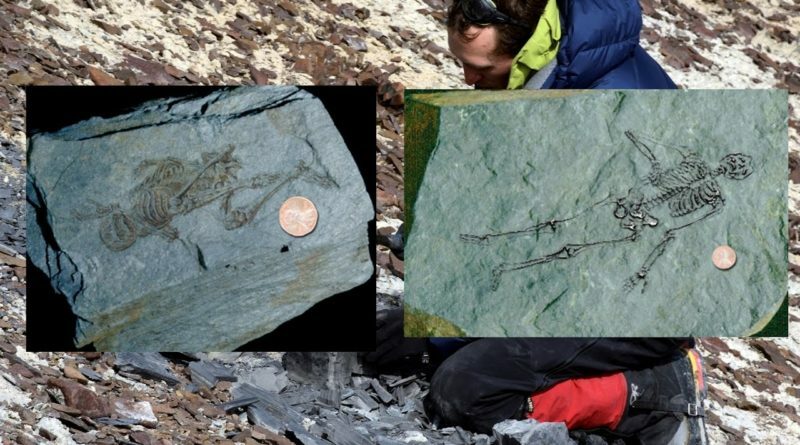 This discovery was made in the rocks on Antarctica’s Whitmore mountain range. The fossils were flown to Washington D.C. for further analysis at the National Institute of Ancient Studies. Intense examination at the scene appears to prove the remains are “at least 600 million years old,” stated a Doctor Marly, a Cambridge University researcher who was in on the discovery. “Six million years ago jellyfish first appeared,” Marly said. “There were no human beings in the world and there wouldn’t be any for nearly five hundred and 60 million years. There weren’t even any dinosaurs around at that time. “When we split the rock apart we were completely confused. Here was this fossil from an age when the appearance of the first vertebrates were still millions of years off and it was a complete skeleton. And not only that, it appeared to be human. It is quite obvious from our study of these skeletons that they are definitely human and not a species of primate. Who they were and how large their population was and if they were technologically advanced is a complete mystery,” Marly was quoted as saying. In studying photos of the fossils we found it difficult to determine if they were real. The story is so incredible we are waiting to read other research papers springing from this find. That the initial story appeared in Science Magazine and was copied verbatim in various other on-line journals has given the story some degree of legitimacy.